If your answer is “no, of course I would not eat gray salmon” – then I have bad news for you. The fanned color wheel above is not paint chips from Sherwin-Williams. It represents salmon dye colors. If you’ve ever eaten farmed salmon (95% of Atlantic salmon is farmed) then you have already eaten gray salmon. It was just wearing a disguise. Below is information from Honey Colony. Your Salmon Is Dyed Pink? Why on earth would companies spend time and money artificially dying our salmon pink? Because the farmed salmon we eat today would be grey without it. 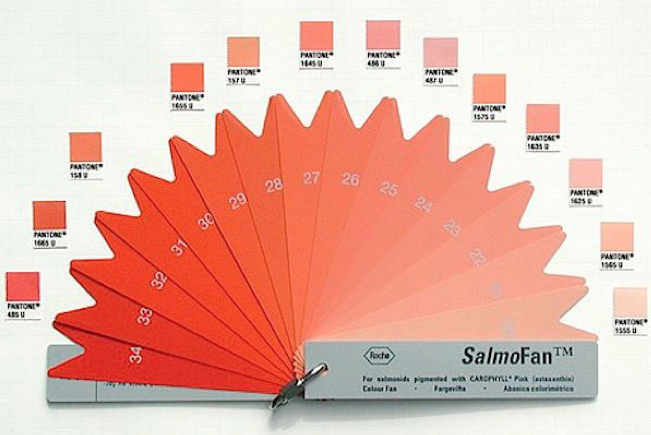 The Salmon Fan above is basically a color wheel for dyed salmon- Canthaxanthin is a pigment used to color the grey farmed salmon. Read whole article, reprinted on Honey Colony. Originally from Cracked. On 2/11/2013 I added the following – taken from a document published by The food Safety Network. Almost 90 per cent of the salmon sold in supermarkets is farmed. The flesh of farmed salmon is naturally grey. In the wild, salmon gets its pinkish color from its diet of small shrimp and small fish containing naturally occurring astaxanthin. Research has shown consumers prefer the same color from farmed salmon, which is why canthaxanthin is used as a feed additive. In the case of poultry, canthaxanthin is used to give the skin and egg yolks a brighter yellow color, also due to consumer preference. ← What can I eat? Oh yuk. Thanks, you give your followers such great info! I am so glad that I stopped eating salmon! First confined breeding. Then the antibiotics and toxins. Now dye? Where does the madness stop? So salmon’s pink for the the same reason flamingos are. I didn’t know that. Thanks ! I’ll continue to favor farmed salmon over wild because that does reduce the pressure on wild stocks. Also, i would imagine, that farmed salmon may have lower mercury levels since their diet is controlled. Wow FO this is an ancient post… and pre-conversion. Although I still tend to go for wild salmon because I want the omega 3s. I assume, perhaps falsely, that omega 3s are higher in wild than farmed. I’ve also heard PCBs are higher in farmed. Probably should find out the truth… if I am a sleuth that is what I must do.